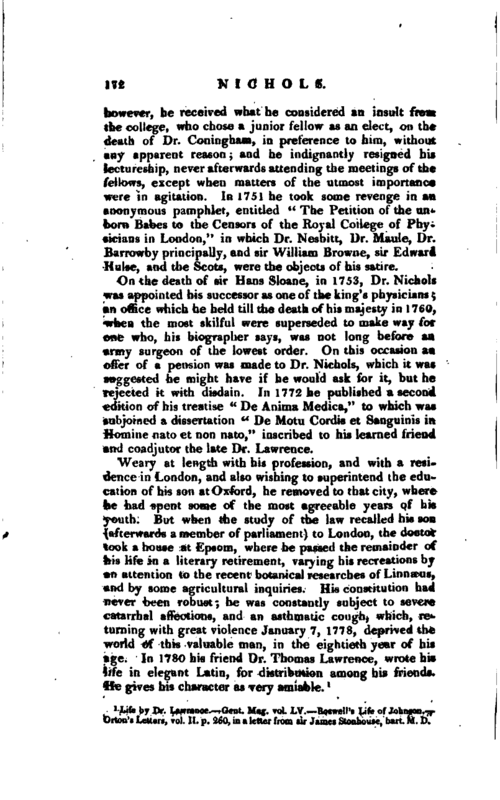 , a physician and anatomist of eminence, was born in London in 1699, where his father was a barrister. After receiving the rudiments of his education at a private school in the country, where his docility and sweetness of temper endeared him to his master and school- fellows, he was in a few years removed to Westminster, and thence to Oxford, where he was admitted a commoner of Exeter college, under the tuition of Mr. John Haviland, in 1714. He applied himself to the usual academical exercises with great assiduity, and took his degrees in arts at the accustomed periods, that of M. A. in 1721. He paid his greatest attention to natural philosophy, and after reading a few books on anatomy, engaged in | dissections, which he pursued with so much reputation as to be chosen reader of anatomy in the university in 1726, about two years after taking his degree of B. M. In this office he used his utmost endeavours to introduce a zeal for this neglected study, and obtained a high and well merited reputation. His residence at Oxford, however, was only temporary; for at the close of his course he returned to London, where he bad determined to settle, after having made a short trial of practice in Cornwall, and a subsequent visit to the principal schools of France and Italy. At Paris, by conversing freely with the learned, he soon recommended himself to their notice and esteem. Winslow’s was the only good system of physiology at that time known in France, and Morgagni’s and Santorini’s, of Venice, in Italy. On his return to England he resumed his anatomical and physiological lectures in London, and they were frequented, not only by students from both the universities, but by many surgeons, apothecaries, and others. His reputation rapidly extended, and in 1728 he was elected a fellow of the royal society, to which he communicated several papers, which were published in the Philosophical Transactions, especially some observations on the nature of aneurisms, in which he controverted the opinion of Dr. Freind; and a description of a singular disease, in which the pulmonary vein was coughed up. He also made observations on a treatise by Helvetius, on the lungs. In 1729, he received the degree of M. D at Oxford, and became a fellow of the college of physicians in. 1732. In 1734 he was appointed to read the Gulstonian lectures at the college, and chose the structure of the heart, and the circulation of the blood, for his subjects. 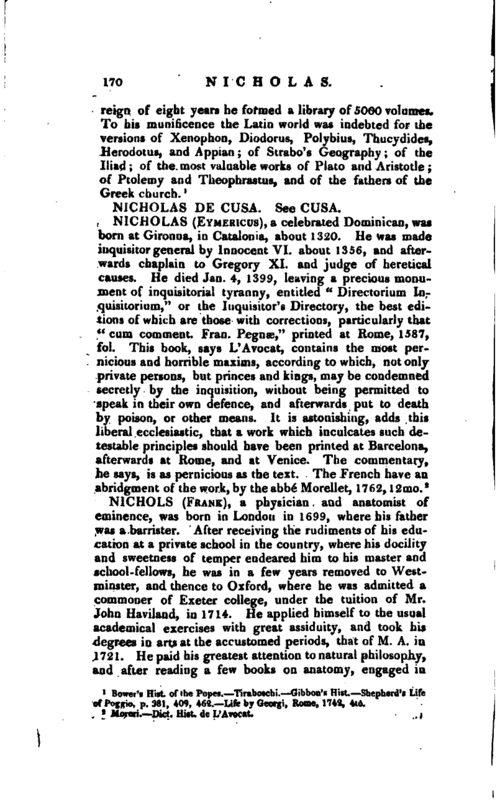 At the request of the president, Dr. Nichols again read the Gulstonian lectures in 1736, choosing for his topics the urinary organs, and the nature and treatment of calculous diseases; and in 1739 he delivered the anniversary Harveian oration. In 1743 he married one of the daughters of the celebrated Dr. Mead, by whom he had a son and daughter, both living. 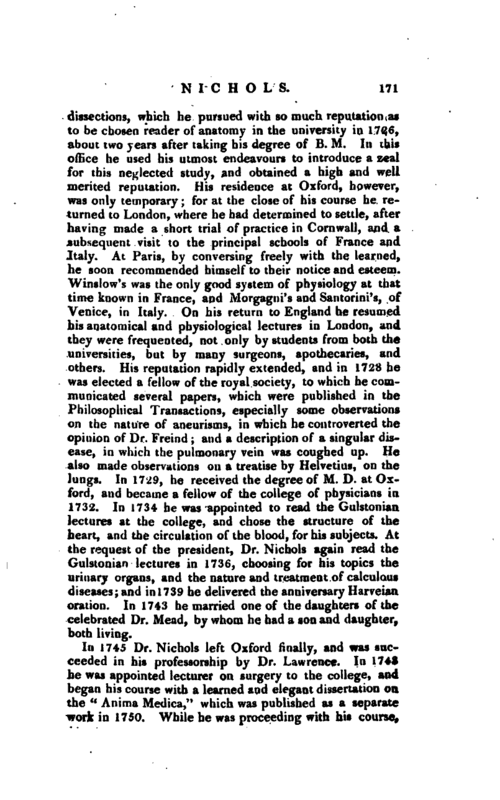 In 1745 Dr. Nichols left Oxford finally, and was succeeded in his professorship by Dr. Lawrence. In 1748 he was appointed lecturer on surgery to the college, and began his course with a learned and elegant dissertation on the “Anima Medica,” which was published as a separate work in 1750. 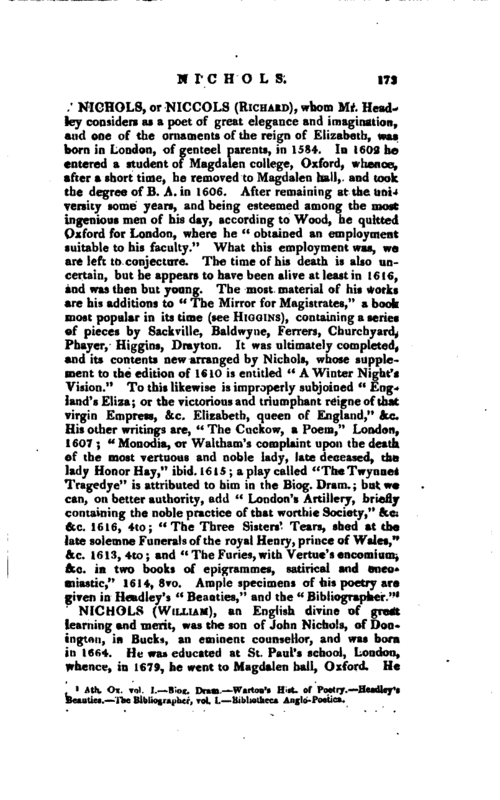 While he was proceeding with his course, | however, he received what he considered an insult from the college, who chose a junior fellow as an elect, on the death of Dr. Coningham, in preference to him, without any apparent reason; and he indignantly resigned his lectureship, never afterwards attending the meetings of the fellows, except when matters of the utmost importance were in agitation. In 1751 he took some revenge in an anonymous pamphlet, entitled " The Petition of the unborn Babes to the Censors of the Royal College of Physicians in London,‘’ in which Dr. Nesbitt, Dr. Maule, Dr. JBarrowby principally, and sir William Browne, yir Edward Hulse, and the Scots, were the objects of his satire. On the death of sir Hans Sloane, in 1753, Dr. Nichols was appointed his successor as one of the king’s physicians an office which he held till the death of his majesty in 1760, when the most skilful were superseded to make way for one who, his biographer says, was not long before an army surgeon of the lowest order. On this occasion an offer of a pension was made to Dr. Nichols, which it was suggested he might have if he would ask for it, but he rejected it with disdain. In 1772 he published a second edition of his treatise “De Anima Medica,” to which was subjoined a dissertation “De Motu Cordis et Sanguinis in Homine nato et non nato,” inscribed to his learned friend and coadjutor the late Dr. Lawrence. Life by Dr. Lawrence.—Gent. Mag. vol. LV.—Boswell’s Life of Johnson.— Orton’s Letters, vol. II, p. 260, in a letter from sir James Stonhouse, bart. M. D.